How do you define yourself? Do you think of yourself mainly in terms of what you do? Or the skills you have? Or by what’s important to you and what you believe? Or by who you are as a person? Or do you define yourself in terms of your purpose, or being part of something that’s bigger and more important than you are? To set the scene some more for this model that we’re about to examine, let’s use the perspective of problem-solving. Imagine someone who has real problems with his neighbours. It might get so bad that he decides to get out of that Environment altogether and move house. If his new neighbours are also ‘difficult’, and he decides to move again, and once more he ends up next door to the ‘neighbours from hell’, you might begin to wonder if there is something he needs to change about his Behaviour in his dealings with other people, since he is the common factor in all of this. If he doesn’t know how else to behave, he may need to learn new skills or Capabilities: maybe some assertive communication, maybe a better way of dealing with conflicts, maybe even some rapport skills. And if he believes that the way he has been behaving is the only right way to behave, he’ll need to change his Beliefs before he can resolve the problem. If those beliefs are core to his Identity, he may have to rethink who he is in order to get a lasting resolution. And in order to get the impetus to do that – it’s a big change, after all – he may have to start considering what is more important to him than he is to himself, or have some kind of road-to-Damascus Spiritual conversion. This example illustrates the model devised by Robert Dilts that he called ‘Logical Levels’ or sometimes ‘Neuro-Logical Levels’, and we’re calling “Levels of Change”. 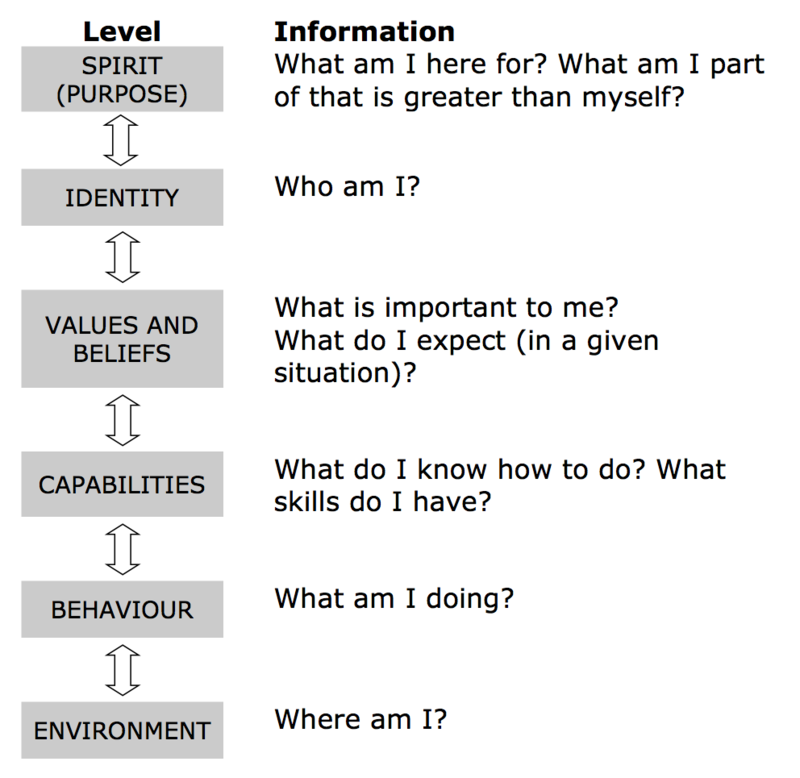 Dilts suggests six levels or frames that you can use to analyse human experience, and particularly any problem or change. Beliefs include cause and effect linkages – you believe that a certain event is caused by something else, or that a particular action will cause certain consequences. We can also include your rules for yourself at this level – “if this happens, I will do that”. And complex equivalences – this means that, or this person or thing can be placed in that category – are also beliefs. Above that we have the level of Identity. This is the level of who you are, your sense of self. Finally – and this is often left out of business NLP books for some reason, maybe they think it will scare the suits – we have the level of Purpose or Spirit. This is what you are part of that is more important to you than you are to yourself; what you feel connected to, and what ultimately you would give up your life for. For some people this will be their religion, for other people it may be some political cause, or their country, or their family, or an idea – or it may be a combination of some of these elements, or there may be a gap there. If there is a gap there – if people haven’t been focused on anything beyond themselves and their immediate problems – that’s when you get people asking themselves questions like “Is that all there is?” or “What now?” when they’ve reached a goal they thought they wanted, or run out of away-from motivation. You’ll be familiar with the Einstein quotation that says something like “No problem can be solved with the same level of thinking that created them.” I don’t know whether he actually said that – he’s the kind of person who people like to project their own views onto – but that quote could be tailor-made for this model. If you remember the guy with neighbour trouble, the symptoms of the trouble showed up at the Environment level. Trying to solve the problem at that same level, by moving to a different environment, didn’t work, because he was causing the problem at a higher level. Maybe it was how he was behaving, maybe he didn’t have the capability to behave any differently, maybe he had the capability but didn’t believe it was right to use it. The way this model works is that the higher up the levels you go, the more leverage you have. A change at a lower level may affect the levels above it; a change at a higher level will definitely the levels below. This is why a lot of training courses don’t stick – because they focus only on the Behaviour and Capability levels. Have you ever had a colleague who went on a course – maybe an assertiveness course or a management skills course – and their behaviour changed for a few days or weeks, but they soon slipped back into the old ways? It’s because they learned new skills (Capability level in this model) but their values, beliefs and sense of identity, that govern whether they use those skills in a particular context didn’t change. Deep down, they wouldn’t feel it was right to use their newly acquired skills, or it wasn’t important enough to them, or it just didn’t feel like them. So, even though in theory they had a new range of skills and behaviour, in practice they reverted to the old ways. So, if you’re aiming to make change happen, make sure that the change is taking place at a sufficiently high level to make it stick. Note: I should point out that this model has been criticised by John Grinder, Wyatt Woodsmall and others as not being true NLP on the grounds that it’s ‘content based’ and that the levels don’t actually form a logical hierarchy. I could add that when it’s described as ‘neuro-logical levels‘, the relationship between each level and different brain structures proposed by Robert Dilts is also pretty tenuous as far as I can see. I agree with many of these criticisms and I make no apologies for discussing the model in an NLP-focused blog. 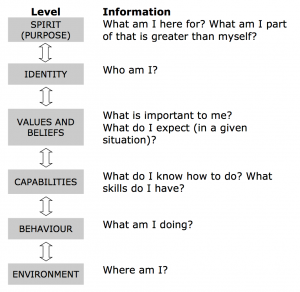 The model came out of NLP, and it’s very useful for understanding change and in coaching. 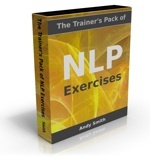 The discussion as to whether it’s pure NLP or not will be irrelevant to most readers who just want practical tools – which this model certainly is.